Summer is the season of love, which means that they’ll be plenty of opportunities to get dolled up and attend weddings! While weddings in the Spring or Winter can be a tad more straightforward in choosing what to wear, Summer weddings can be a challenge. With no many different venues and themes, it may be hard to find the perfect balance of comfort and dressing appropriately for the occasion. But hopefully, with the help of these perfect Summer getups from our favorite fashion bloggers, you’ll be inspired for all of the wedding invites up ahead for the season. Best of all: Each look compromises of pieces that are universally flattering for all body types. The sun is shining and flowers are blooming around you on this warm but beautiful day. Instead of a dream opt for a beautiful patterned skirt and a cool, light blouse. Pastel colors are the perfect palette for outdoor weddings, so that your look will go beautifully with your surrounds. A flared midi skirt is universally flattering to all body types, so you’ll feel confident and look the part, too. Attending a traditional wedding at a church, estate or other indoor location? Keep it simple and sleek in a classic wrap dress. Stay true to the Summer hues by opting for a bold (but not overpowering) color choice. Some ruffle details or a high-low hemline are the perfect accents to kick this look into high gear. Heading to the seaside for a boat wedding? It can get chilly on the sea, so dress with removable layers by incorporating a shawl — or better yet, a cozy cardigan. Play up your look with light metallics and pastels so that you blend with the colors of the sunset. 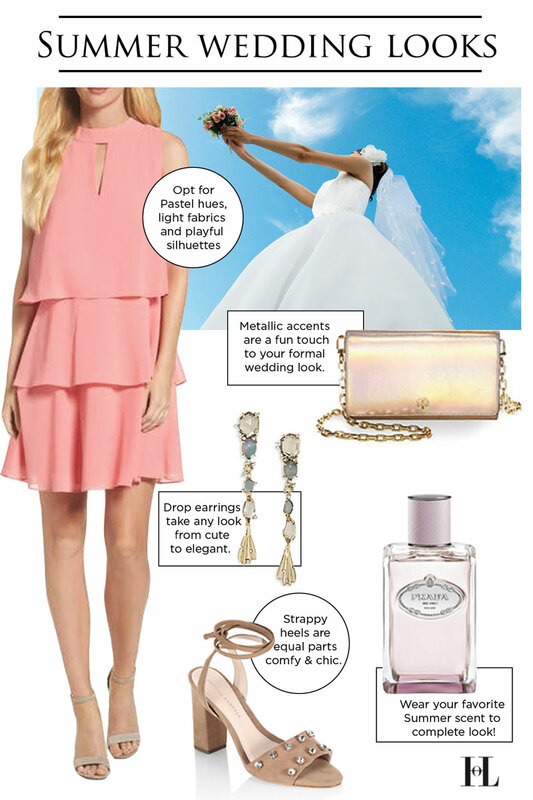 Your accessories will be the key to making this look wedding-ready. A nighttime wedding allows for room to play with hues. While darker colors are usually reserved for weddings in the colder months, they get a pass for night time ceremonies, bringing an elevated (more formal) vibe to the festivities. Keep it breezy in a light, flowy dress and add a summer touch with flesh-toned accessories.